Hair styler Rotating Iron straightens, curls & styles your hair. The secret to the Hair styler iron lies in its rotating-heated-polishing cylinder, along with four rows of precision-aligned bristles. Plus, the Hair styler rotating hot iron does so much more than any styling tool out there. Get lift and fullness right from the root! Get a flip . It is Hair styler rotating hot iron rod.Straighten even the toughest, most coarse hair and still get fullness and style without the stick-straight 'flatness' of a flat iron.Wrap your hair around the rotating polishing cylinder and get an amazing curl that lasts all day! If you can hold it, you can do it with the Hair styler rotating hot iron!. 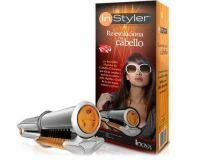 1 Inova Instyler The Rotating Iron,hair Straightener And Curling Iron.